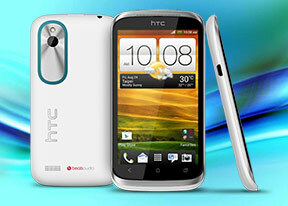 The HTC Desire X packs a 5MP auto-focus camera that does stills of up to 2592 x 1944 pixels and records VGA video @ 30fps. There is a LED flash, but unfortunately no shutter key, which would've been useful given the presence of autofocus. At least, touch focusing is present, so you can use that instead. To snap a photo, you tap the virtual shutter button. To record video, you tap the button below it. We found the dual interface convenient, but it does have a few drawbacks. For one, if you're shooting video at the highest resolution possible, VGA, once you hit the record button the frame shrinks down to 4:3. This can make framing a bit tricky, as you don't get to see the actual dimensions of the image until you start recording. The 5 MP camera onboard the Desire X does okay in terms of speed of focus and capture but leaves something to be desired in terms of image quality. The amount of resolved detail is hardly worth writing home about, as it seems that the overly aggressive noise reduction wipes out most of the fine detail. Colors aren't very accurate, either, and there's notable fringing. Neither of those is bad enough to make photos unusable for sharing on Facebook and similarly less-demanding tasks, but you shouldn't expect wonders from this one. HTC's camera also features HDR mode, which we were also able to test during our review. The HDR effect is a bit too exaggerated and the stitching of images leads to some artifacts (not the leaves in the upper right corner of the first shot), but the result is not too bad. In fact HDR is probably, the better part of the HTC Desire X camera performance. The HTC Desire X joins the other 5MP shooters in our Photo Compare Tool. The tool's page will give you enough info on how to use it and what to look for. The WVGA (800 x 480) recording capabilities of the Desire X are nothing to write home about, especially in this day and age when it seems that every other device out there is capable of 720p recording. The lack of HD video recording is made worse by the fact that the Desire X is actually a dual-core smartphone, which should be able to handle at least 720p. If you can get past the low resolution, the camcorder itself has quality similar to that seen in the still image samples - slightly-skewed white balance and low amount of resolved detail. Here a video sample from the HTC Desire X. Videos are stored in MP4 files and have a variable fps which generally hovers around the 28fps mark with a bitrate of around 3Mbps. Audio gets recorded at a sampling rate of 44kHz, a bitrate of 96Kbps and is mono. Here's an untouched VGA@30fps sample for download.